Yes, indeed, guys, the Great Harry Potter Controversy has begun. We've had three people weigh in already. They are in the Comments section under the last post; go ahead and look at them. In the interest of generating even MORE debate, however, I'm going to post those comments here as well. I hope that reading these comments will make you want to write some of your own. You are right I like Percy Jackson way more than Harry Potter but I still like them. P.S I am on the second book. I've been a Harry Potter fan since book 3. It's not so much the story line, which is classic hero's journey, but how she incorporated so many things into the writing. How when I go back to read them, after reading the whole series, I can see so many connections. Things she would mention and would come to mean more later. Her willingness to take some chances - I mean she killed a major character! I think any aspiring YA/MG writer could learn a lot from Rowling. That said, I'm also a Rick Riordan fan. Have read all PJ plus Kane Chronicles and Lost Hero. I've actually read the KC twice. I think Rick displays more versatility in this series than in PJ. Harry Potter is one of my favorites but not my favorite.The 39 clues is a really great book seires.Dan and Amy have a grandmother Who is one of the Cahills Eurikta,Jaunus,Tomas and Luician.Dan and Amy travel around the world with their babysiter Nellie.It's a big Adventure. All right, some agree with me and some don't. How about YOU?? Where do YOU stand on the Great Harry Potter Controversy? Write your thoughts in the Comments section under this or the last post. HEY GUYS!! 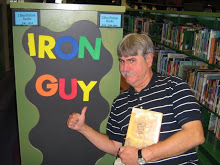 It's me, Iron Guy Carl, and I'm back on the blog beat. I'm sorry I haven't posted anything in almost a month but, as I said Saturday, summer is the busiest time of year for the library. I've been busier than a centipede at a tap dancing competition! I'm sure you've wondered where I was. Our good friend Sammer came to the library one day said he's been reading the blog regularly and waiting for a post. So sorry, Sammer! Also, let me give an apology to the guy who sent in a review of The Adventurous Deeds of Deadwood Jones. It accidentally got sent to my spam file and was deleted before I could publish it. Would you send it again, my friend, and write it in a "comment" section under any post. I'll be sure to post it. Anyway, being busy is good--that means a lot of you are out there checking out books. So come on and keep me busy! I'm not a Harry Potter fan. All right, you can all get up off the ground. I told you the shock would knock you flat!! But that's the whole truth. I'm not a big-time Harry Potter fan and never have been. Not when Harry made the cover of a major magazine. Not when all my fellow librarians were going nuts over him. Not even when kids (and librarians) lined up to get copies of the latest books at midnight. Not even when a blogger I respect and regularly read (her name is Elizabeth Bird) said she became a kid's librarian after reading the second HP book. ("I should tell you that this is a very personal book for me. It’s the book that turned me into a children’s librarian in the first place. In fact, if I were to be completely honest with you, I’d have to say that Harry Potter and the Chamber of Secrets changed my life.") A Harry Potter fan? No, no, no, it ain't me, boys. Now don't get me wrong--I'm not saying that I dislike these books. I read the first three and liked them. I liked the second book a lot. They're fun, fast-moving, and funny. (Except for that fourth one. I tried to read it and it was like swimming upstream) Anyway, I did enjoy those books but just wasn't blown away by them like everyone else. Maybe that's the most controversial opinion to have. Rather than going gaga-nuts over them like the rest of the world, I think they're---OK. I MUCH prefer the Percy Jackson books. For that matter, I like the Erec Rex books a whole lot more. SO HERE'S THE CONTROVERSY--I want YOU to tell me why I'm either right or wrong. Is Harry Potter the greatest thing since hot pizza?? Then make me believe it! Or do you agree with me? Do you have books that you like better? Tell us what they are and why you like them more. All right, men, we're all waiting to hear from you! Who will be the first to weigh in on the Great Harry Potter Controversy? PS--if you want to see what I and your fellow reader guys have said about HP, Percy Jackson and Erec Rex, go to the "Labels" section on the left-hand side of the page. I must warn you--there's a lot!